Stir-fried pointed cabbage doesn’t really sound that amazing. So I thought when the 老闆娘 at Plumhaus Berlin suggested this dish, but I soon changed my mind. Boy, it was so delicious I had to try it at home and guess what : it is super easy to make, ridiculously cheap, vegetarian and absolutely YUMMY. 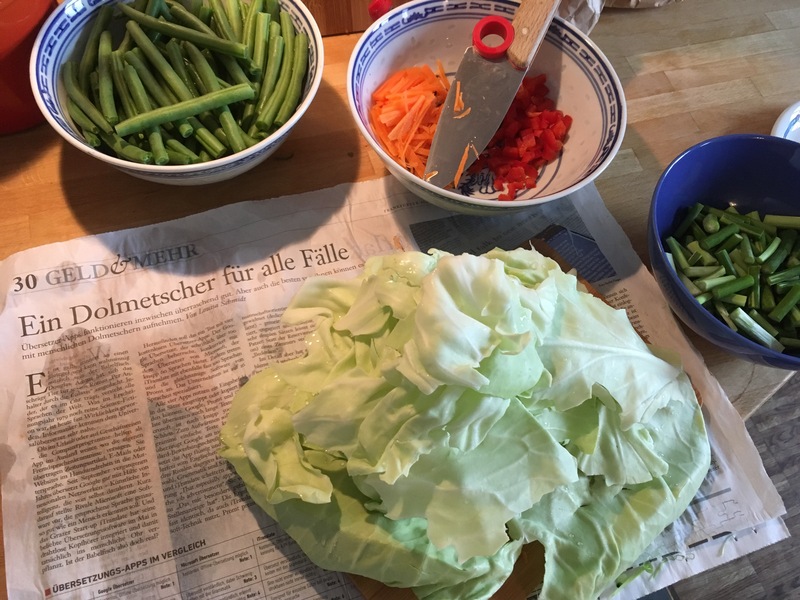 Take about half a kilo of cabbage (pointed/sweetheart cabbage works really well), rinse, pat dry and shred into bite-sized pieces. 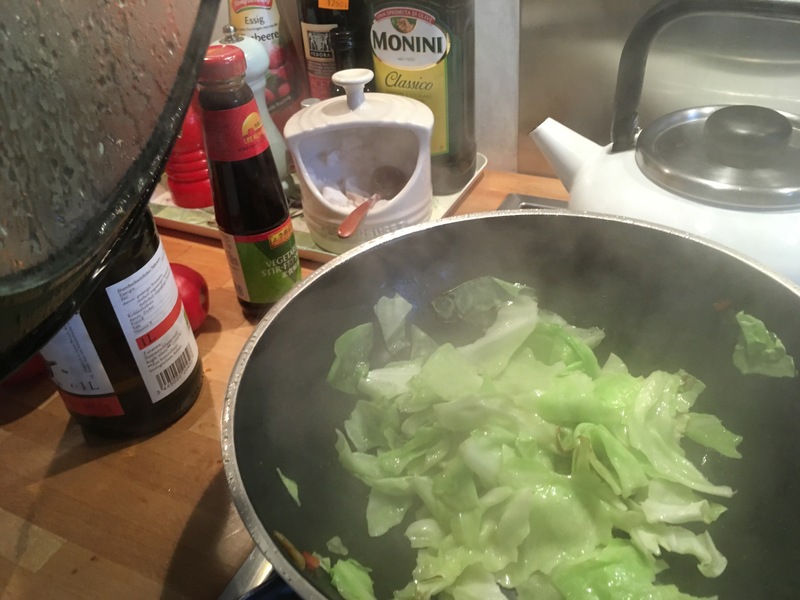 Add a generous amount of oil to a wok (at least 5 tablespoons), add cabbage and stir-fry quickly over a high flame. As soon as the cabbage softens and begins to brown, take it out. 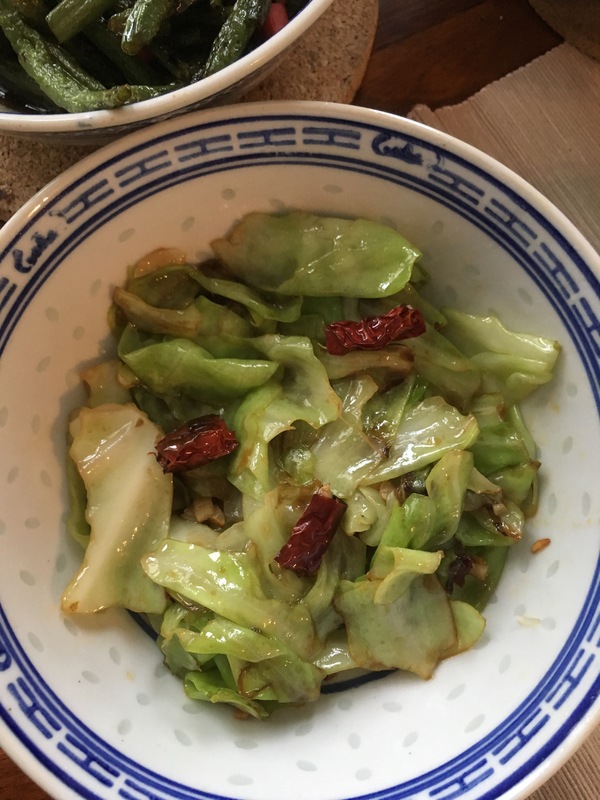 Put some crushed garlic and dried chillies into the wok and quickly stir-fry (炒出香味, then add some oyster sauce (I used vegetarian oyster sauce) and the cabbage. Whilst I’m at it, I might as well share some of my favourite cucumber recipes. 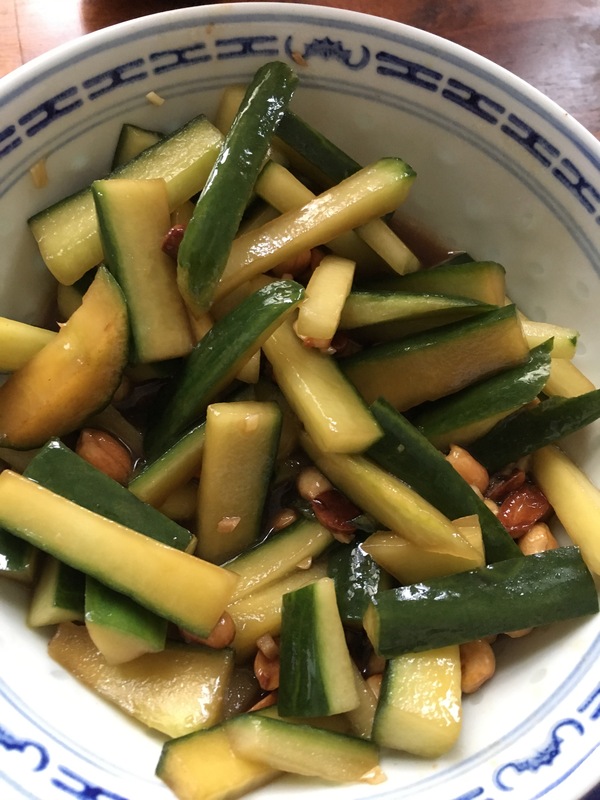 So far, I can offer Chinese 拍黄瓜 (2 versions), Taiwanese 凉拌黄瓜 (pictures to follow)and Korean pickled cucumber 오이나물, all of which make for great cold starters or side dishes. 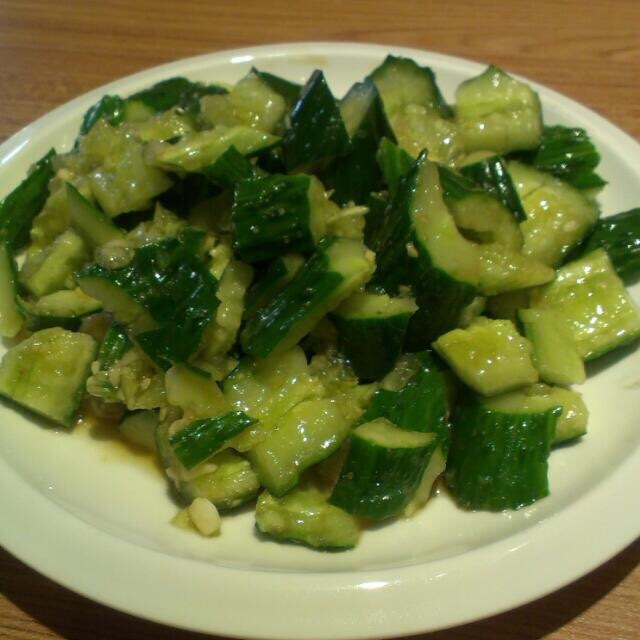 拍黄瓜literally means beaten/smashed cucumber, and that is exactly what you do. Ready to get rid of some pent-up anger? Need to relieve some inner tension? This is, most certainly, one of the tastiest (if slightly messy) ways of doing so! For best results, use a proper vegetable knife or cleaver. 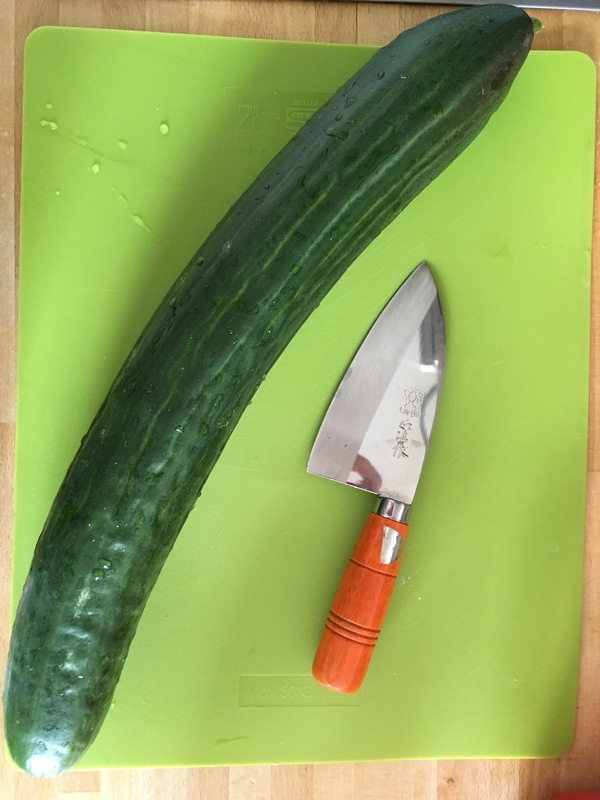 Place the cucumber on a chopping board and remove any object in the near vicinity. 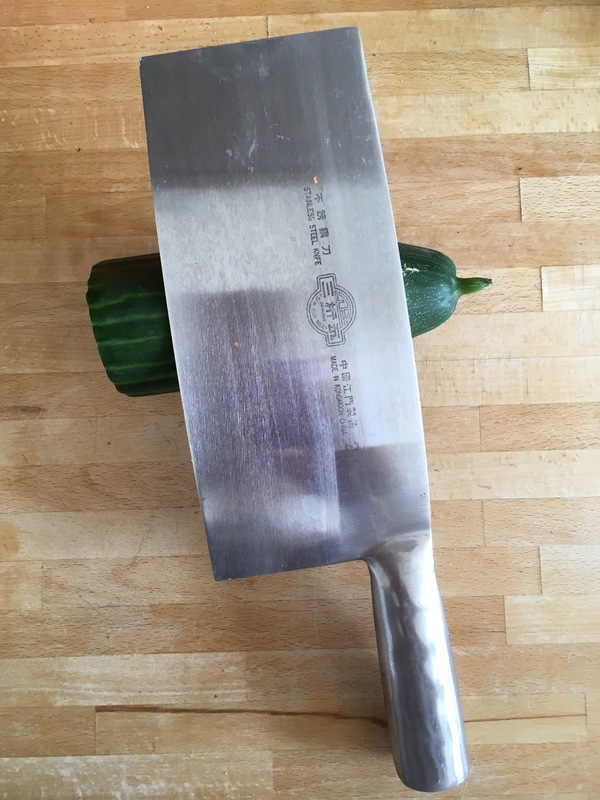 Use the flat side of the blade to smash the cucumber (I usually cut the cucumber into a few pieces first to somewhat reduce the splashing) until it breaks apart. Cut the fragments into bite-sized pieces and place in a bowl. Sprinkle with salt. Next, mince garlic and, optionally, crush some dried chillies. Mix with cucumbers. Then add vinegar ( I prefer white rice vinegar for this dish, but brown vinegar will do nicely, too), a hint of soy sauce and a few drops of sesame oil. Place lid on bowl and shake well, then serve immediately. 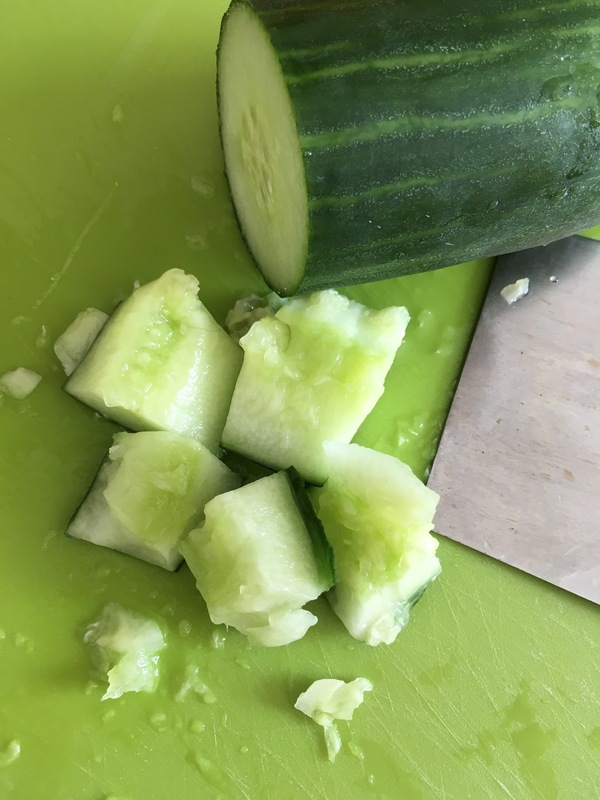 Slice cucumber length-wise and cut into 3cm strips. Mix soy sauce, salt, sugar and vinegar in a small bowl. Heat sesame oil in a small pan, add chilli flakes and stir-fry over low heat to release the fragrance. As you take the pan off the heat, put in garlic and stir, then mix the content with the ingredients in the bowl. pour over cucumber, toss lightly and place in refrigerator. Before serving, roast peanuts in little oil until they turn a golden brown. 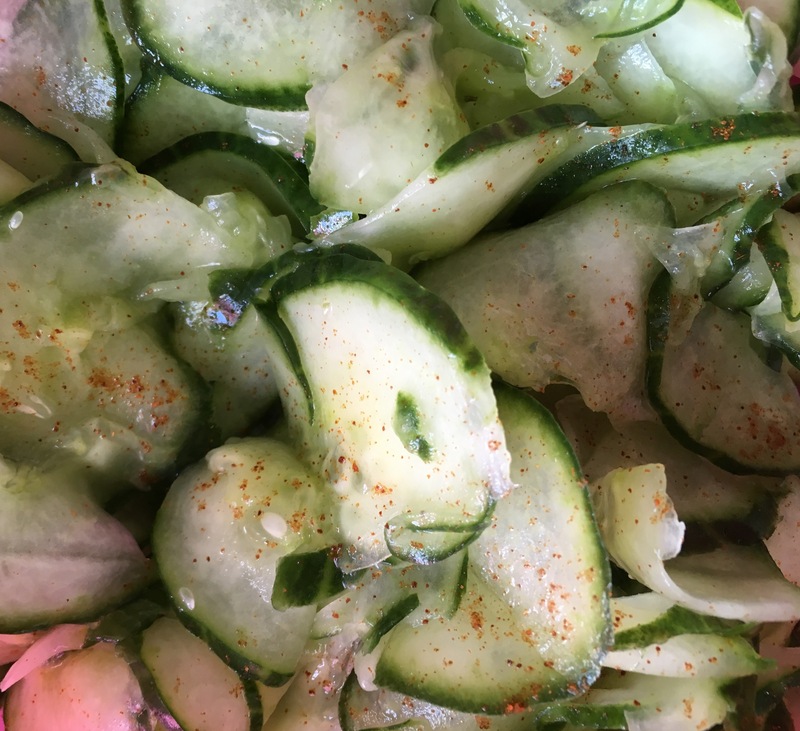 Sprinkle over cucumbers and serve. This dish tastes even better on the second day, provided you have any left! This is a very easy, quick-to-make side dish, also perfect for bibimbap (see previous blog post). For best results, pickle several hours in advance and place in fridge. Slice cucumber into very thin slices, mix with salt and leave for 20 minutes, then rinse with cold water. Drain off excess liquid in a colander and gently squeeze cucumbers dry. Return to bowl. Mix rice vinegar with sugar and chilli powder (or sweet pepper powder). Cover bowl and place in fridge. Serve chilled. 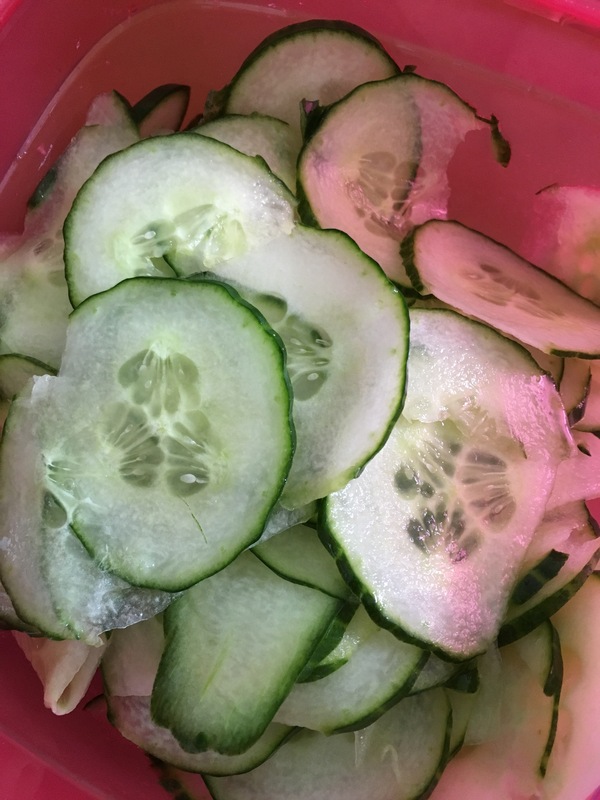 Cut cucumber into strips (similar to Chinese cucumber II). Heat 2 spoonfuls of white vinegar, add two spoons of sugar and wait until it has completely dissolved. Let mixture cool down, then pour over cucumber. Add chillies if required and place in the refrigerator for at least a few hours. 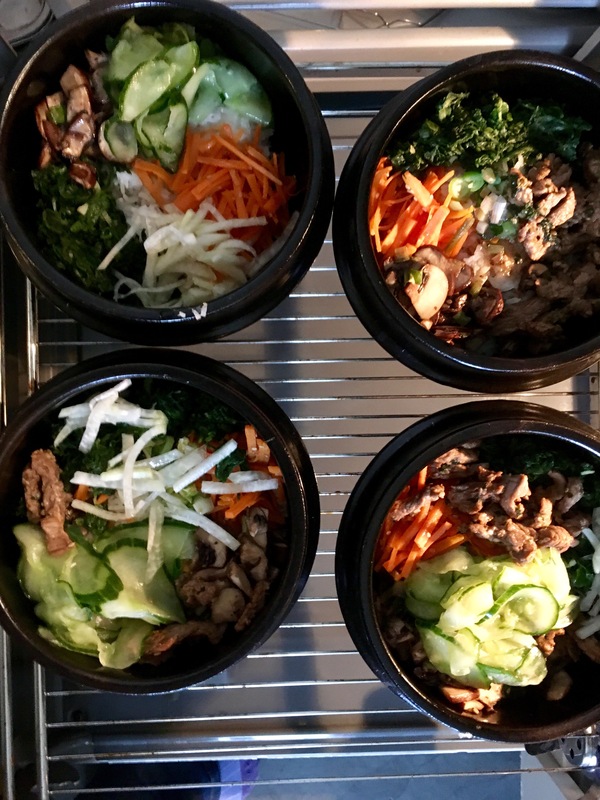 So today I am making Bibimbap (비빔밥), Korean mixed rice with vegetables (and meat), one of my favourite comfort foods in the world, especially for cold and grey autumn days like today. There are many variations of this dish, and as long as you have rice, eggs and some vegetables at home, you’ll always be able to conjure up a fabulastic meal. It is also a great way to get the little ones to eat some veggies. My boy loves his bap, so I will share both the adult (spicy and mainly cooked ingredients) and the child recipe (mainly raw vegetables) with you. 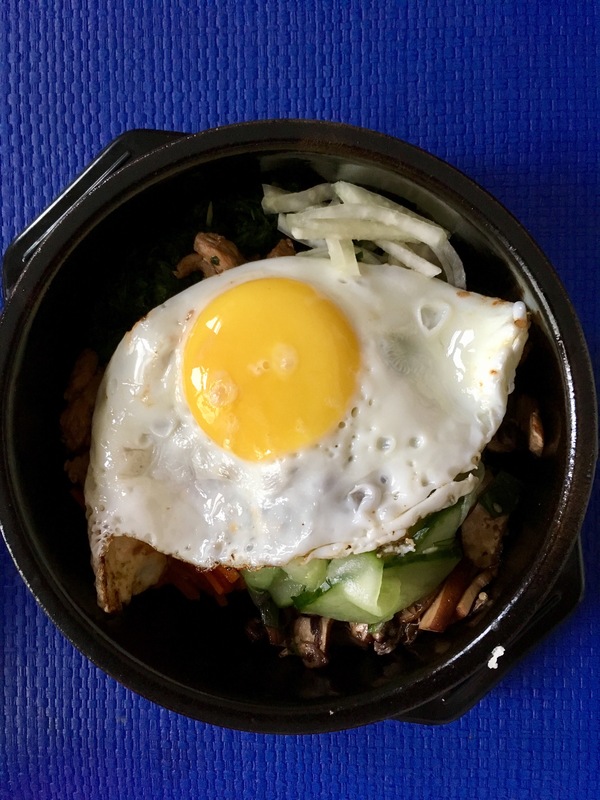 Bibimbap is served in bowls or stone pots (dolsot bibimbap). This dish can be served with meat, but also makes for a tasty vegetarian/vegan dish if you just skip the beef and/or egg. Step 1: Cook the rice in a pot or rice cooker. Make sure you don’t add too much water, as the rice should not be too soggy. Place the dolsot into the oven and pre-heat. Step 2: Pickle cucumber and radish. You could just chop/slice and add them raw, but I prefer pickling them, ideally a few hours in advance. 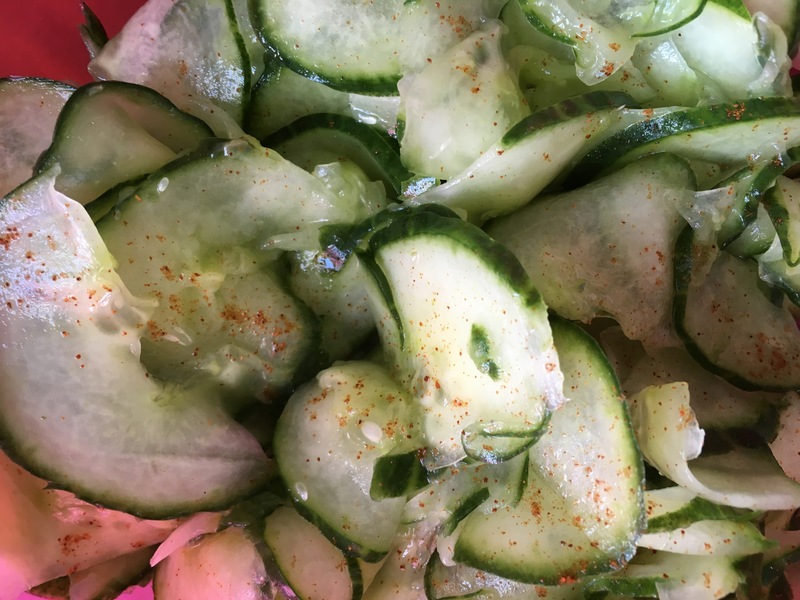 For this slice cucumber into very thin slices, mix with salt and leave for 20 minutes, then rinse with cold water. Drain off excess liquid in a colander and gently squeeze cucumbers dry. Return to bowl. Mix rice vinegar with sugar and chilli powder (or sweet pepper powder). Cover bowl and place in fridge. Cut the radish into match sticks, mix with salt and leave in a bowl to absorb the salt. After 15 mins, rinse and pat dry with kitchen cloth. Add sugar, sesame oil, chilli powder and vinegar, cover and cool in fridge. Step 3: Julienne beef and marinade in Teriyaki sauce. Add sesame seeds. Later, preferably just before you want to serve, stir-fry quickly until just about done. 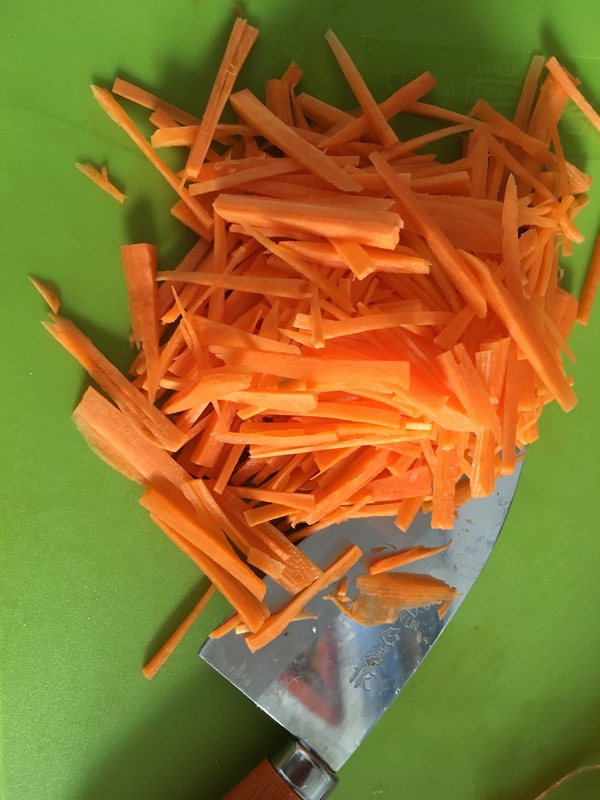 Carrots: peel and cut into match sticks. Sauté in a lightly oiled pan for 1 – 2 minutes over medium heat, sprinkle with sesame seeds, add salt to taste. mushrooms: cut into thin slices and stir-fry with oil and scallions. Step 5: fry eggs sunny side up. Put a serving of cooked rice in each dolsot, then add vegetables and meat if desired. Sprinkle with sesame seeds, scallions, ginger. Add one fried egg and a dollop of red chilli paste to each and serve. For the kids’ version I usually omit the less popular vegetables and stick with julienned carrots and cucumbers (add here any other veg your kid may like, raw or cooked). Instead of the spicy chilli paste, my boy uses soy sauce or *shameface* ketchup. It is definitely a family dish as everyone can add or leave out what they like or dislike, and on top of being scrumptilicious, it is alsoperfect for getting rid of leftovers. My son’s favorite food “ever”! The name may not sound very appealing but this is indeed one of the yummiest bean dishes in the world. 干煸 literally means dry-fry, but most people nowadays deep-fry the beans for a quicker result. 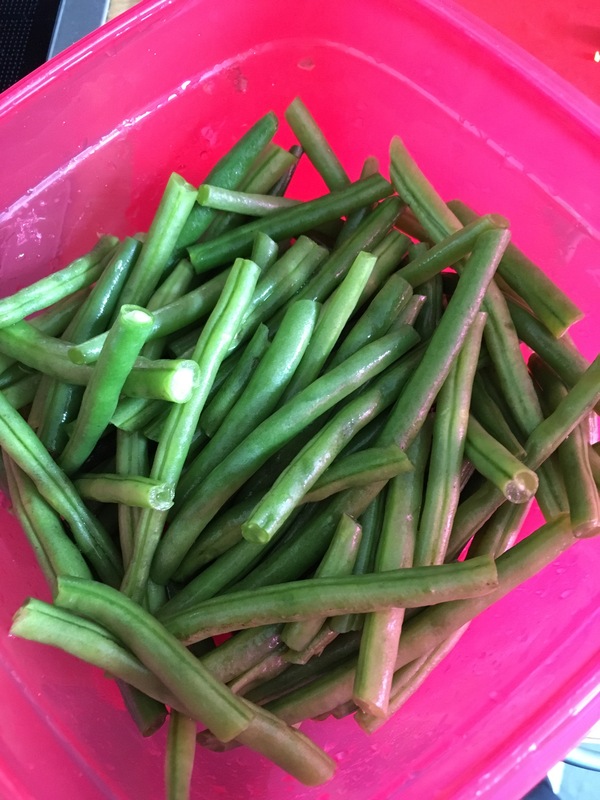 500g green (French) beans (best results with fresh ones, deep-frozen ones don’t fry that nicely). In Sichuan you would add Sichusn pepper and some preserved (mustard) vegetable, I don’t use either. That’s it for my Vegetarian version, you could add some ground pork for extra flavour. Cut the ends off the beans and trim them, if they are very long, cut them in half. Heat wok until it begins to smoke, then add enough oil to deep-fry. Add beans and deep-fry until they start to shrivel. This usually takes 6-8 minutes. Remove beans from wok using a slotted spoon, place into a bowl and pat away excessive oil with a bit of kitchen cloth. Heat fresh oil (about one tbsp) on a high flame and add garlic, scallions, ginger and chillies. 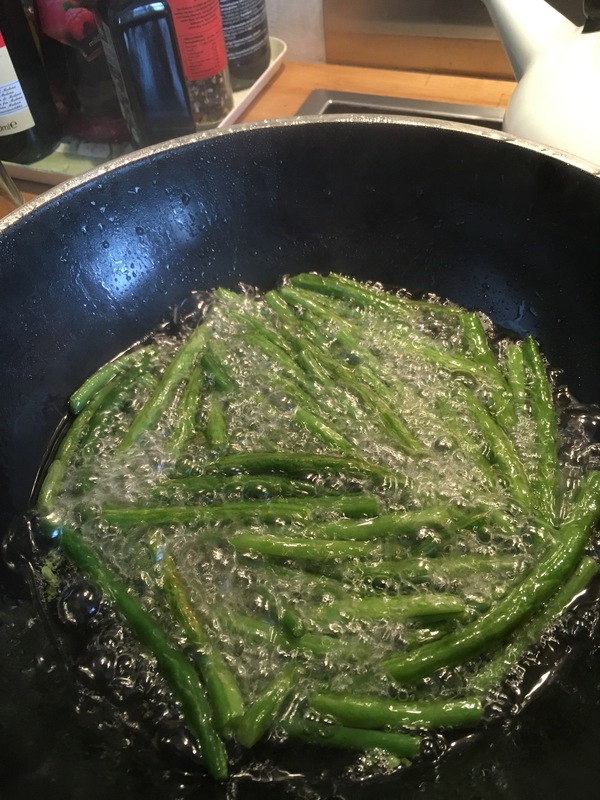 Fry quickly, then add the green beans, the red pepper cubes as well as soy sauce, sugar and salt. Stir, taste and adjust the seasoning if desired. A couple of weeks ago, a friend took us to this amazing little fish restaurant in Salzburg (http://www.pescheria-backi.com/). To be honest, I don’t really like seafood much, but this plate just blew my socks off. There is plenty of fresh fish to choose from in a glass cabinet by the entrance. Not experts at all, we asked the waiter for a recommendation, upon which he suggested the fish of the day with “a few king prawns”, a plate for 3, €25 each. And he couldn’t have suggested any better. The fish was delicious, the prawns enormous and juicy and the white house wine chilled and fruity. Lovers of seafood and those not yet aware of it, don’t miss this gem of a restaurant, the food is great, the atmosphere is lovely and the service is superb. Bon appétit! Excited by the euphoric praise of fellow Bloggers and determined to expand my “Authentic Chinese Food in Berlin” portfolio, I ventured to Prenzlauer Berg last night to see if Lao Xiang (Wichertstraße 43 ) really does offer the best Chinese cuisine in the City. Things did look rather promising at first. The menu is huge (http://laoxiang.de/menus/) and the pictures of all the delicacies made me drool for sure. 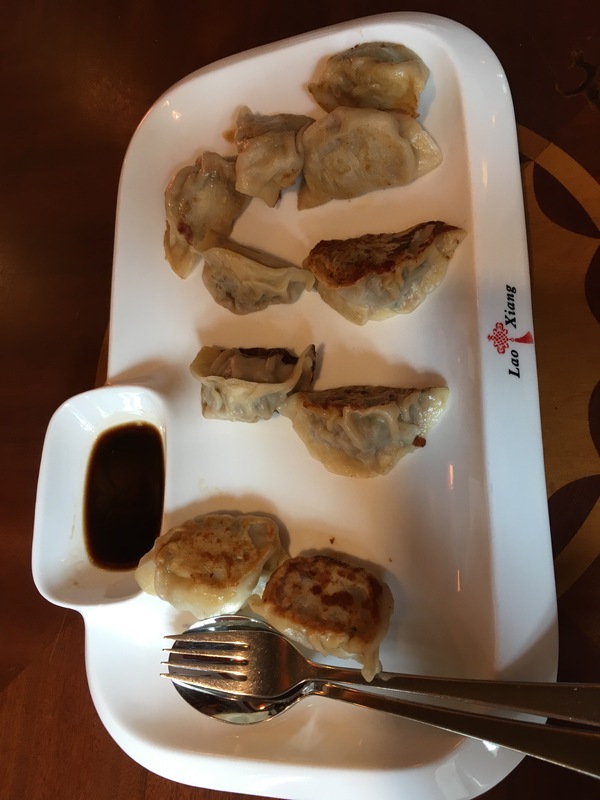 The dumplings came first and I was pretty happy with them. They were fried on one side but rather soft altogether, the filling (meat and chives) was moist and super juicy, a rather yummy affair altogether. Sadly, the other dishes left much to be desired. 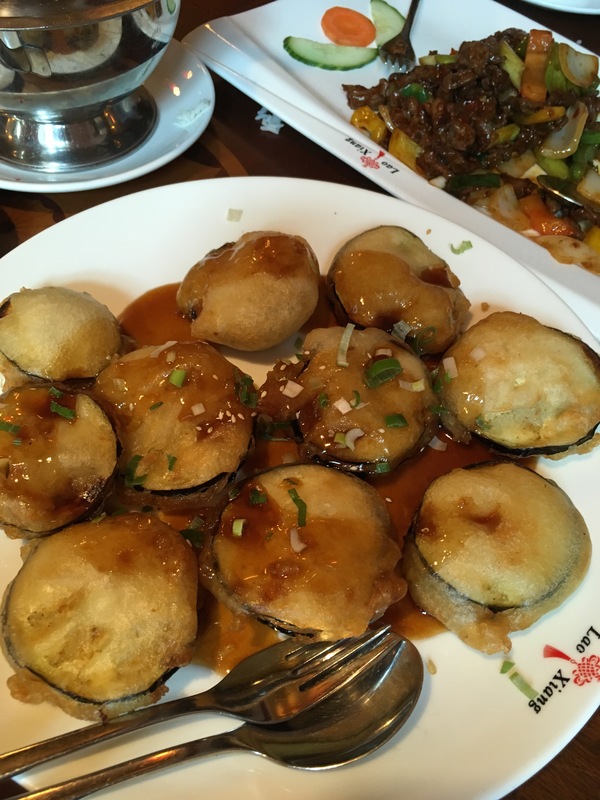 The eggplants tasted mainly of oil, the minced meat inside hardly added flavour and I found the sauce rather bland, too. The lamb looked and tasted like beef and veered on the salty side. The veggies were nice and crunchy though. Apart from the fact that the sesame balls should have been covered in sesame, which they were not, they were rather on the oily side, too, and the filling didn’t exactly stand out taste-wise either. As to the beans, they marked the peak of my discontent. 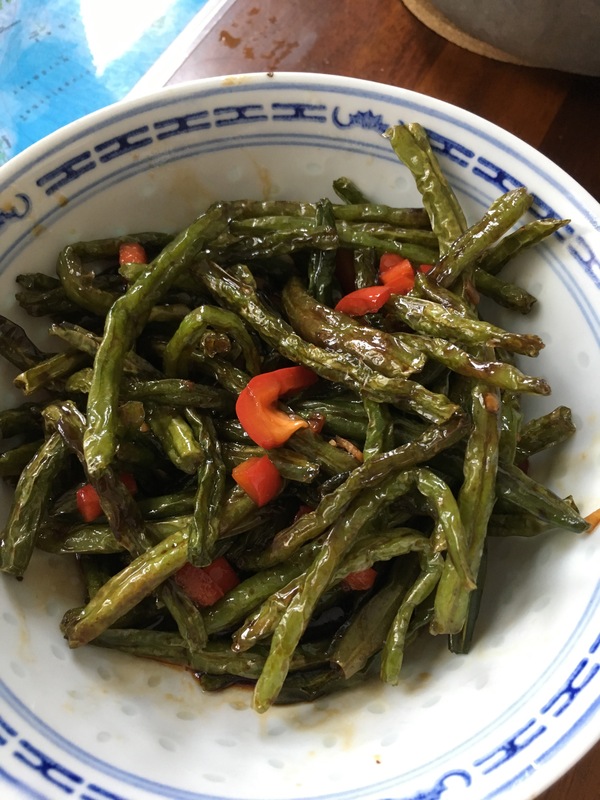 干煸, literally dry stir-frying, means that you use rather a lot of oil and no water to fry the vegetables until the skin starts to wrinkle slightly (炸至外皮略皱) and, in the case of beans, turns a brownish shade of yellow. This gives the dish a very unique, slightly smoky flavour. Yesterday’s beans looked like they came straight from the freezer, which is no good for 干煸, as there will be too much moisture in them. You could tell at once they had not been fried long enough as they were perfectly green with no wrinkles whatsoever. Some were still hard inside, too. 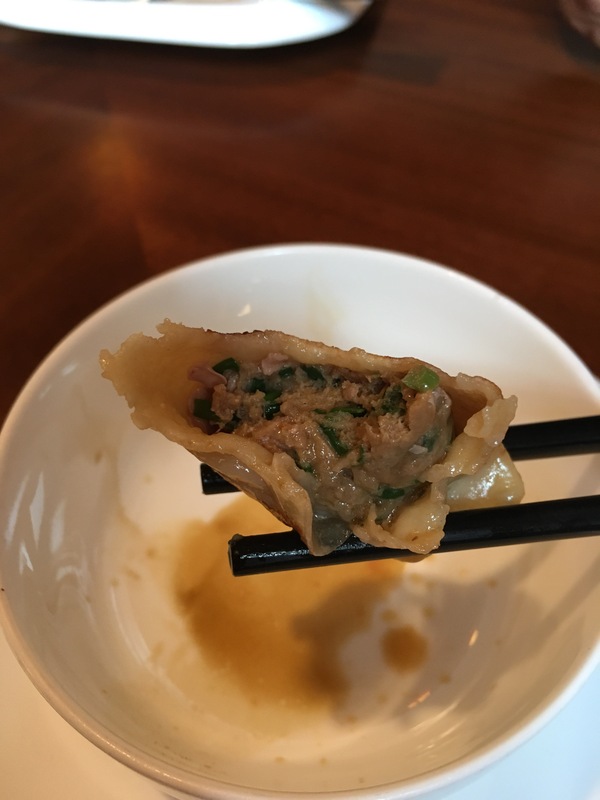 Lao Xiang serves the vegetarian version of this dish (which traditionally has some minced meat in it). I don’t mind that at all as long as the beans have enough flavour. 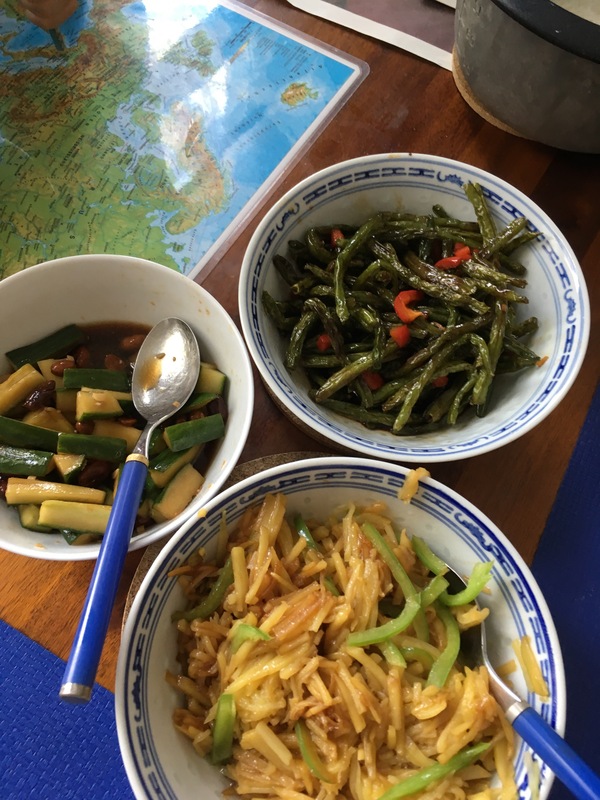 Yet, yesterday’s plate showed no traces of either garlic or ginger or spring onion, the only spice came from a couple of red chillies scattered across the beans. I do admit my expectations towards Chinese food are rather high and the dishes are definitely still above average compared to most other Chinese restaurants in Germany, and maybe the cook just had a bit of a bad day yesterday, but I must say I don’t think the food at Lao Xiang is anywhere near as good and “authentic” (I do think this expression is over-extensively used) as “Dajia Le” (to be reviewed again later on this week) or “Shaniu’s House of Noodles”. As I am based in Schoeneberg, most of the places I know are in this part of the city. Do you know of any other great Chinese eateries? Please let me know! Wondering whether my trousers are delighted? And at what? Oder doch lieber ein Treibsandpaket? Und wie man Pilze vertraulich zubereitet ist mir auch noch ein Rätsel! Appetizing trotters noodles are my new favourite!